Picture: L/R: Ms Maria Helena de Senna Fernandes, Director – Macao Government Tourism Office; Mr. Li Jianping, Director of Asia Tourism Exchange Center of China National Tourism Administration, Dr. Chris Bottril, Vice Chairman – PATA; Dr. Alexis Tam, Secretary for Social Affairs and Culture of Macao SAR Government; Dr. Mario Hardy, CEO – PATA; by Mr. Ip Peng Kin, Chief of Office of Secretary for Social Affairs and Culture of Macao SAR Government, and Datuk Seri Mirza Mohammad Taiyab, Director General – Tourism Malaysia. MACAO SAR, 2017-Sep-15 — /Travel PR News/ — The 40th edition of PATA Travel Mart 2017 (PTM 2017), hosted by the Macao Government Tourism Office (MGTO), has attracted 1,131 delegates from 66 global destinations. The delegate numbers embraced 460 sellers from 252 organisations and 37 destinations, along with 293 buyers from 281 organisations and 51 source markets. PTM 2017 officially opened in Macao SAR on September 13. 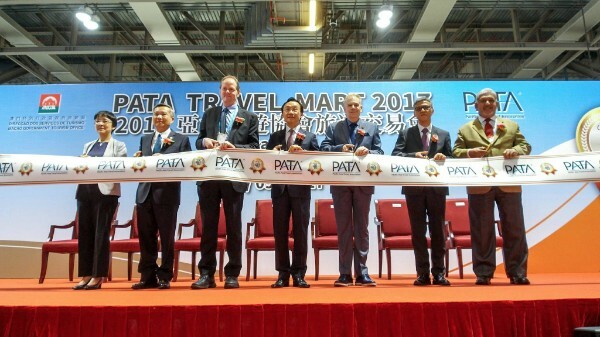 MGTO Director Ms Maria Helena de Senna Fernandes said, “Each year, PATA Travel Mart helps to bring to the limelight the host destination, and for this edition Macao is excited to take the opportunity to show our new tourism attractions that have come into operation since we last met in our city in 2010. PTM 2017 also welcomed the SheTrades Pavilion hosted by the International Trade Centre (ITC). SheTrades, a flagship initiative of ITC, provides women entrepreneurs around the world with a unique network and platform to connect to international markets. The official opening ceremony on Thursday, September 14 was conducted by Dr. Alexis Tam, Secretary for Social Affairs and Culture of Macao SAR Government and Chairman of the Macao Host Committee of PATA Travel Mart 2017, accompanied by Mr. Ip Peng Kin, Chief of Office of Secretary for Social Affairs and Culture of Macao SAR Government; Ms Maria Helena de Senna Fernandes, Director of the Macao Government Tourism Office; Dr Chris Bottrill, PATA Vice Chairman; Dr Mario Hardy, PATA CEO; Datuk Seri Mirza Mohammad Taiyab, Director General of Tourism Malaysia, and Mr. Li Jianping, Director of Asia Tourism Exchange Center of China National Tourism Administration. Dr Hardy also praised the Travel Weekly Group for co-organising the Travolution Forum Asia: ‘Redefining the Travel Experience’, and the Professional Travel Bloggers Association for co-organising the Blogger and Key Opinion Leader Forum. The events, held on September 13, allowed delegates to gain further insights into travel industry trends. Presentations from both forums will be available at www.PATA.org/ptm-2017. This entry was posted in Travel, Travel Marketing and tagged Alexis Tam, Dr. Mario Hardy, Ms Maria Helena de Senna Fernandes, PATA Travel Mart 2017. Bookmark the permalink.